Before the zero waste movement arrived in the Klang Valley, there was BYOB. 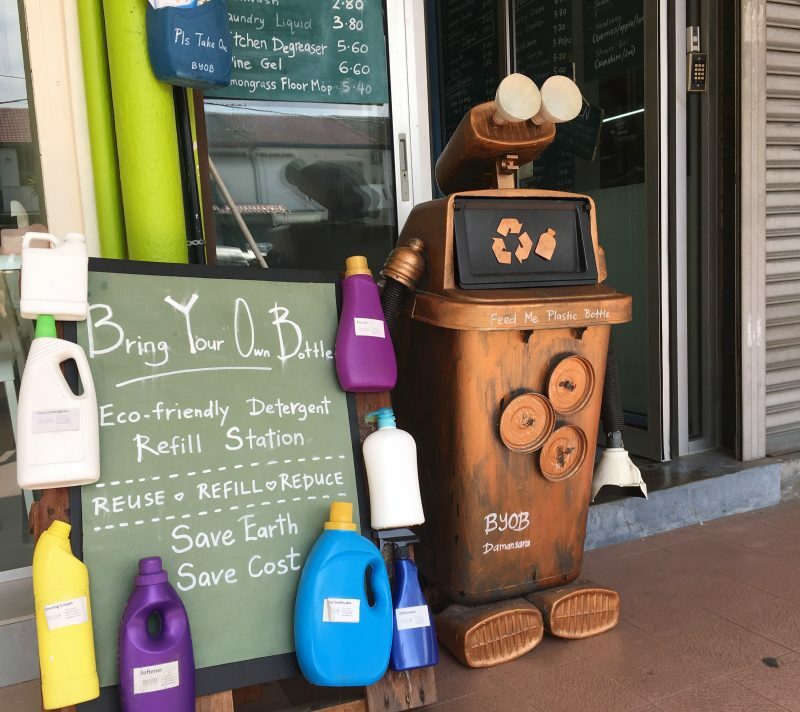 One of my favourite places in Damansara; BYOB (short for “Bring Your Own Bottle”) brought us one of the first introductions to an accessible way of cutting down on our plastic use. Established in 2011, it’s a one stop shop for you to refill all your home cleaning solutions by reusing the bottles you already have. You get twice the benefit here; it’s a wonderful way to save some money by not paying for plastic packaging, and you do your bit for the environment by saving plastic bottles from becoming trash. 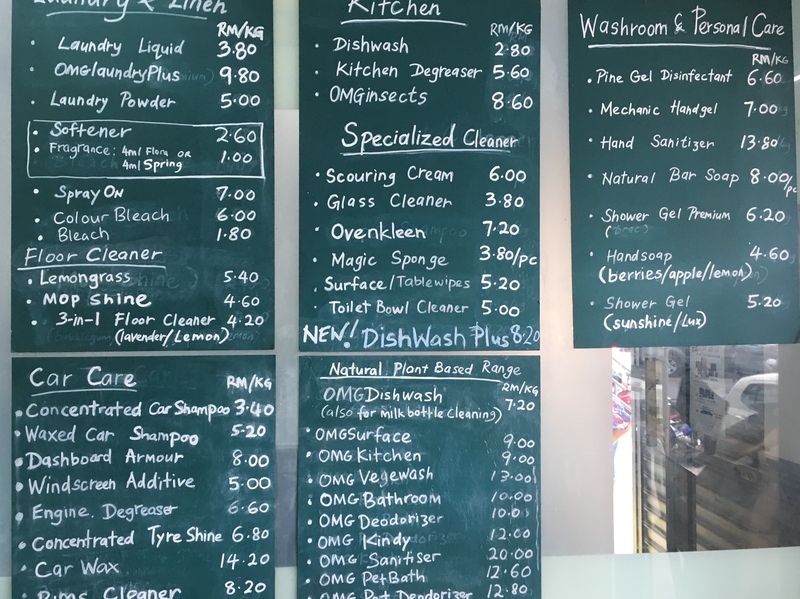 You can get everything you need for your home; from floor cleaner, to personal body care, even carwash shampoo. The products available for refill are between their normal range and their natural ‘OMG’ range. The normal range is biodegradable and safe for our waterways while the natural OMG range is completely plant-based. Their range has grown substantially over the years, and you’ll notice their prices are very affordable! You bring your empty bottles and request for the ones that you need refilled at the counter. They fill it behind the counter from large dispensers and then stick paper labels on your bottle so that you can easily identify them. I tend to refill the same bottles so that I won’t need a new paper label each time, or I scribble on the bottles with permanent marker pen. Their minimum order is 1 litre of each product to minimise waste in spillage during refilling. Most of the time, you would buy at least 1 litre of any product in the supermarket anyway, so the empty bottles you have at home will serve well for their minimum order. It’s important to note that they have recently stopped accepting mineral water bottles for refill due to their softer material. The soft drink bottles like Coke and 100 Plus can be used, as these 1.5 litre PET bottles are more hardy. To purchase bleach however, it should be filled into an empty bleach bottle as that is even thicker. They also don’t accept glass bottles for safety reasons, especially with glass bottles being heavier and the danger of slippery hands if any soap suds are on it. When we buy conventional cleaning products, we actually pay a substantial portion for the packaging itself. Those plastic bottles though are usually really hardy, and can be reused many, many times over, yet we usually chuck it after a single use. Well, BYOB is here to turn that notion on its head. What if I don’t have bottles ? / What if I have extra bottles? You can donate your empty detergent bottles, shampoo and body shower bottles, and 1.5 litre soft drink bottles here if you are not using them as well. Reusing those bottles would save the additional carbon footprint it would take to recycle them and save the plastic packaging of another. Similarly, if you’ve run out of bottles or don’t have any with you, they have reused bottles available there too. Win-win! When I use conventional products from the supermarket, my hands get really dry and tight due to the chemicals. I am practically running for the nearest bottle of moisturiser after washing dishes. Whether I’ve purchased the normal range or the natural range, one thing I noticed from using the BYOB products is how comfortable my hands felt during and after. It didn’t feel like I was dipping into a pail of hard chemicals stripping my hand of its natural moisture. Personally, I use the lemongrass floor cleaner, the laundry solution, the dishwashing liquid and the OMG Pet Bath for Daisie (she loves it and she smells amazing). The final push of conversion of my entire household was when my mother, who usually insists on using her high strength chemical cleaners, realised that their Lemongrass Floor Cleaner was really good. 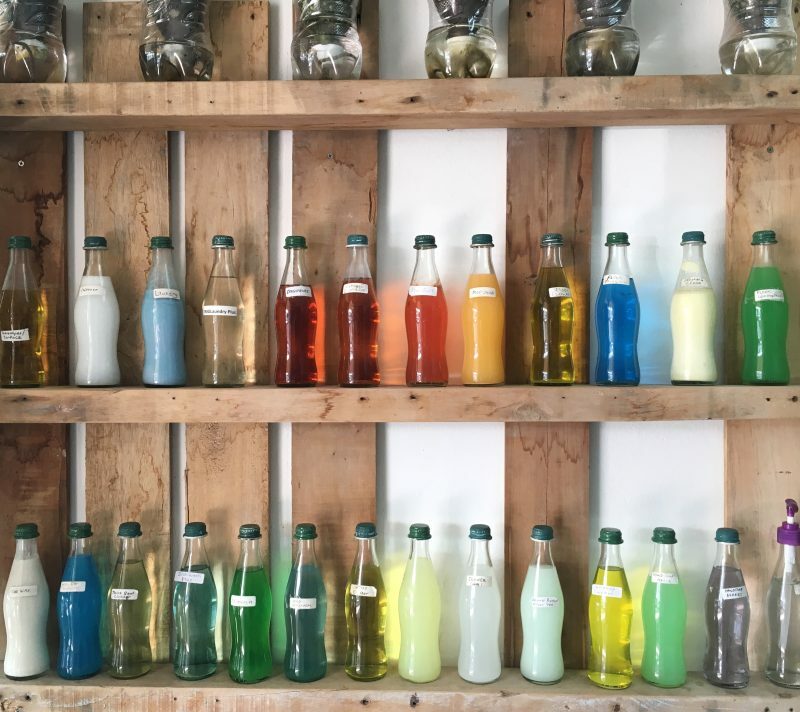 I’ve only met the owner, Clytia, briefly during a Zero Waste festival last year when I refilled some of my bottles, and usually see Manik, who minds the store. They’re helpful with questions, especially with first-timers needing advice on options for cleaning. Before the green movement was as visible as it is now, BYOB took a bet on bringing the community a service providing eco-friendly solutions. 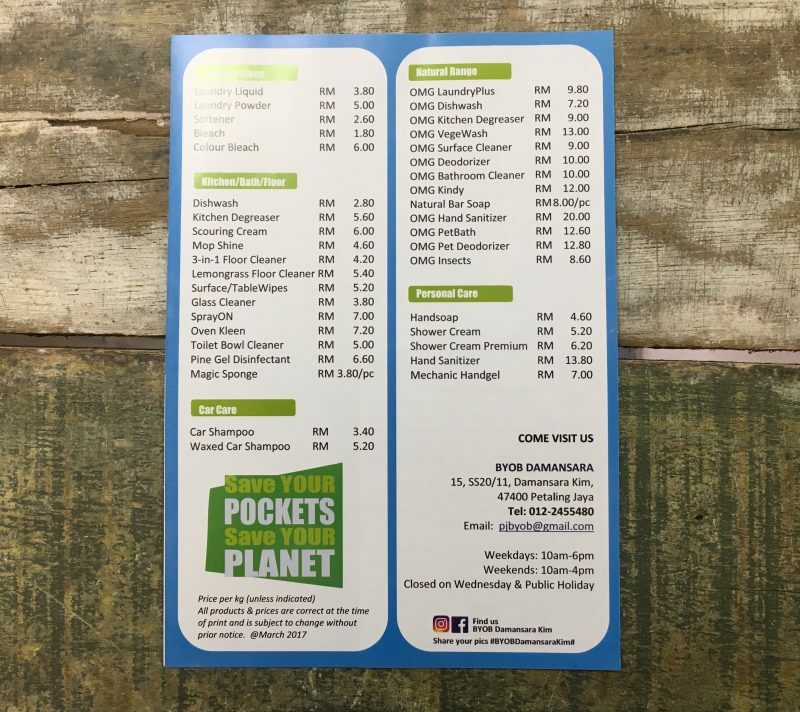 They were an instrumental part of the growth of the eco-conscious population in KL, and continue to be a valued part of our ecosystem here in the Klang Valley. Refilling a good quality, plastic bottle is a pretty approachable idea for most people, especially when it helps you save money. I’ve always found BYOB to be a great way to introduce your less eco-conscious friends and family to a simple (and very attractive!) way to reduce their single use plastic consumption. Hopefully, a domino effect will begin as they explore new ways to reduce on waste. Check them out, and have fun shopping!